Contact lens wearers - ever wondered why you are more likely to experience eye infections than your contacts-less friends? Researchers from NYU Langone Medical Center in New York City think they may have found the answer, in a study that used high-precision genetic tests to map the human microbiome. Society for Microbiology on May 31st in New Orleans, LA, the NYU Langone researchers report that micro-organisms residing in the eyes of people who wear contact lenses daily more closely resemble micro-organisms residing in eyelid skin than the bacteria usually found in the eyes of people who do not wear contacts. analysis of swabs and used contact lenses allowed the team to identify which bacteria were present. 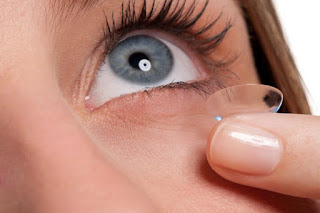 (conjunctiva) of contact lens wearers than on the eye surfaces of the control group. Examining the bacterial diversity using a plotted graph, the team observed that the eye microbiome of contact lens wearers is more similar in composition to the microbiome of their skin than the eye microbiome of non-lens wearers. found in greater amounts in the eyes of non-lens wearers. eye infections than people who wear contacts. direct pressure of the lens altering the immune system in the eye and hope to identify in greater detail which bacteria thrive or are suppressed in this environment. prone to eye infections than non-lens wearers," she adds. improper contact lens care boosts risk of this condition and potentially blindness.